By Jeff Aranow: Saul Canelo Alvarez is standing is standing in IBF/IBO/WBA/WBC middleweight champion Gennady ‘GGG’ Golovkin’s way from meeting WBO middleweight champion Billy Joe Saunders in a unification fight later this year in a fight that will have 4 major titles on the line. Golovkin (37-0-1, 33 KOs) wants to unify the middleweight division, and so does Saunders. They both want the unification. Saunders understands fully that Canelo Alvarez will not fight him if he beats Golovkin in their rematch on May 5. That’s why Saunders is counting on Golovkin to win that fight. He knows it’s his best and perhaps only chance of a big money fight for the time being. If Canelo beats Golovkin in the rematch, the WBC title will be vacated straightaway by the Mexican star, and he’ll have no reason to want to fight Saunders, because his goal is not to unify the 160lb division. Canelo’s goal is to make the biggest fights possible, and Saunders is not a household name in the States for him to be worthy of a fight. Saunders has wanted the Golovkin fight for a couple of years now. It’s all he’s talked about, and now he’s poised to get that fight if things work out for the Kazakhstan fighter in his rematch with Canelo on the 5th of May on HBO pay-per-view. Saunders (26-0, 12 KOs) has to be successful in his title defense of his WBO belt against Martin Murray (36-4-1, 17 KOs) on April 14 at the O2 Arena in London, England. Saunders isn’t looking past the 36-year-old Murray, but he’s also not worrying about him too much. Saunders knows what he’s facing in an older fighter challenging for the last time for a world title. 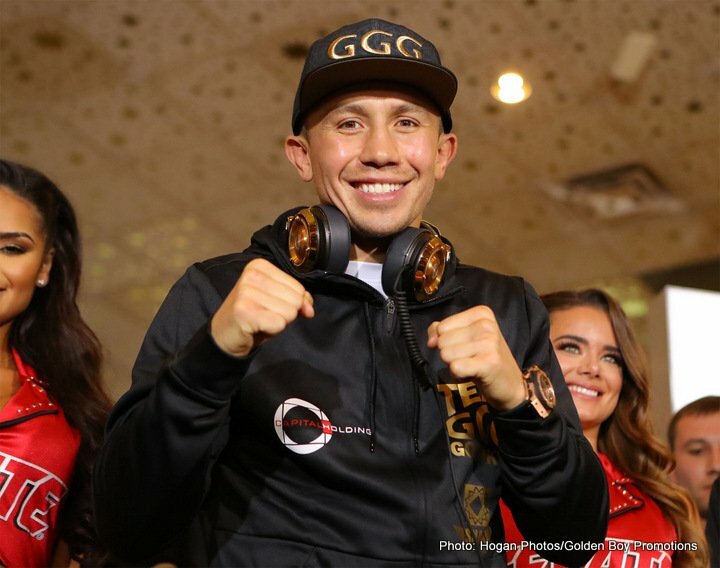 Golovkin still has to do his part in beating the 27-year-old Canelo, which may not be easy to do given how close their previous fight was on September 16th at the T-Mobile Arena in Las Vegas, Nevada. The judges scored that fight a 12 round draw. Already, many boxing fans, trainers, fighters and members of the media are picking Canelo to beat Golovkin. Very few people view Golovkin as the favorite in the fight, as the base their opinion how Canelo finished strong the last September. Golovkin must show a lot more in the rematch otherwise he’s going to lose the fight. Saunders won’t get his chance for a unification fight with Triple G. Saunders might be able to defend his WBO title if he chooses against a beaten Golovkin, but the interest in the fight will likely be less than it would have been. For the GGG-Saunders fight to be huge, Golovkin must beat Canelo in their rematch on May 5th. Golovkin vs. Saunders will be a huge fight if both guys have their titles when they meet. Golovkin, 35, will have to figure out how to catch up to Saunders to land his shots. Saunders’ last opponent David Lemieux was missing punches all night long last December in losing a one-sided 12 round unanimous decision in Quebec, Canada. Lemieux tried hard to land his big power shots, but Saunders was too fast with his movement in getting out of the way of his punches. It was a great performance by Saunders. If he fights in the same way against Golovkin, he could deal him a defeat as well. It won’t be easy though. Golovkin has fought 3 straight matches against fighters that have used movement against him in Canelo, Danny Jacobs and Kell Brook. You can imagine that Golovkin will be well versed at cutting off the ring by the time he fights Saunders later this year if he’s able to beat Canelo in the rematch. Saunders, 28, thinks he’ll beat Golovkin no problems. He thinks he can do what he did to Lemieux to Golovkin by hitting and moving out of the way for 12 rounds. It’s not going to be easy though for Saunders. If Golovkin can deal with Canelo’s movement in their rematch on May 5th, then it’s highly probable that he’ll handle any movement that Saunders uses in the fight. Canelo’s boxing fans believe that he won’t use a lot of movement in the Golovkin rematch. They’re expecting him to stand and brawl with Golovkin for as long as the fight lasts, but it’s more likely that Canelo will fight exactly like he did last time, because it worked well enough for him not to take punishment and get knocked out. If Saunders beats Golovkin, then there would be a rematch between the two of them in the UK. The winner of that fight would almost surely face Canelo, even if it’s Saunders. Canelo won’t be able to resist fighting Saunders if he beats Golovkin twice. There would be too much incentive for Canelo not to take that fight. Saunders will be well known in the U.S if he is able to defeat GGG twice. So it would be a great fight for Canelo to take against Saunders under that circumstance.